Godsent delivers one of the sharpest story lines in Science Fiction for many years. Zoran Jevtic, who co-authored one of the scripts Keanu Reeves read prior to the Matrix, presents us with a fresh new voice in speculative fiction that is already snagging the attention of some of the biggest names in the business. Ray Kurzweil’s site describes it as Genre Defining and from what we can see that’s no exaggeration. The plot concerns Eugene Reece, just an ordinary man who carries the virtualised intellect of the deceased. Just one of billions in perfectly ordinary in post crash re-booted Earth. Until his death. And that’s when his troubles begin. His expected digital resurrection hasn’t gone entirely according to plan and he finds he has a couple of passengers, a neurosynth named Dimitrix and Cornelius, a lawyer. Stranded somewhere not quite on this Earth they have to unravel the mysteries of their joint existence whilst finding a way back to Earth. But the Earth they find is in chaos and a massive off-world resettlement programme is in operation. Zoran Jevtic has worked closely great cultural theorist Jean Baudrillard whose ideas on the way technological progress affects social change have clearly had a major impact on this book. Playing as he does with metaphysics and enough hard science concepts to keep the most hardened Sci-Fi reader running to his reference library, Godsent is truly original. The story moves Science Fiction forwards once more and away from the overly simplistic dystopian worlds rehashed by too many writers these days. Jevtic dares to break new ground and is to be congratulated on achieving something profoundly different. We look forward to seeing more from this author. 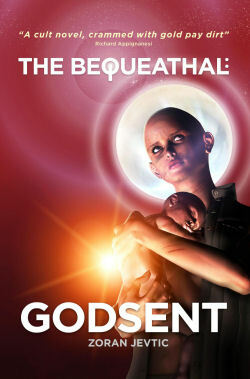 The Bequeathal – Godsent is published by Netherworld Books and is available from all good bookshops and online both as paperback and eBook in all major formats. From the publisher: Netherworld Books continue their support of new authors and are proud to present Zoran Jevtic as an author to watch out for.